FERRY, MICHAEL AUGUSTUS (1872-1943), pioneer racing commentator, was born on 24 November 1872 at Albury, New South Wales, second son of Irish parents Bryan Ferry, servant and later grazier, and his wife Bridget, née Ferry. By 1894 he was a grazier at Bullenbong, near Hanging Rock; defeated by the long drought, he was working as a labourer in Sydney in 1898-1900. About 1900 he went to Perth and in May next year his appointment as a racecourse detective, at a guinea ($2.10) a meeting, was confirmed by the West Australian Turf Club. In 1904 he was employed as a wool-classer. He later claimed to have been a steward and handicapper in the West and the Riverina. He was associated with A. E. Cochran, owner of the Belmont Park racecourse, who in 1905 sent him to France, Britain and the United States of America looking for bloodstock. By 1908 Mick Ferry had set up as a horse-dealer at Wagga Wagga, New South Wales, and bought and sold horses for the Indian market. In 1911 he gathered together a team of rough-riders and buck-jumpers which he took to England, probably for the Festival of Empire. About 1923 Ferry left Wagga and moved to Randwick, Sydney where he worked as a labourer. At his own suggestion, in 1925 he began early morning broadcasts of the training gallops for radio station 2FC (then a private company). They proved so popular that he was asked to do race commentaries—his first big race broadcast was the Australian Jockey Club Easter meeting in 1925. At first commentators were not allowed on racecourses. At Canterbury Ferry broadcast from a fowlyard, often feeding the birds to keep them quiet, and at Moorefield his stand was outside the course at the top of the straight—in the final drive to the winning post he could see only the horses' rumps, which made it difficult to pick the places, especially in big fields. By October 1926 2FC had a private stand at Randwick. Ferry spoke in 'clear incisive tones' and allowed 'a little of the excitement … to creep into his voice'. He often called a horse during the race as '100 to 1 on' to win, and was never nonplussed if it failed. From 1932 he continued his broadcasts for the Australian Broadcasting Commission. In addition to actual race broadcasts, Ferry clocked the training gallops and reported back on form over 2FC long before the newspapers appeared. He attended and reported on the annual yearling sales, took part in ball-to-ball descriptions of Test matches and was racing correspondent for several Queensland newspapers. Until his last illness he supplied the A.B.C. with acceptances and results as well as assisting with race commentaries. Ferry died from cancer at the Sacred Heart Hospice, Darlinghurst, on 5 April 1943 and was buried in the Catholic section of Botany cemetery. He was survived by his wife Julia née Condon, whom he had married in Sydney on 25 October 1927; she celebrated her hundredth birthday in 1972 and died on 6 November 1975. I think it is more likely to be an electronic scrapbook rather than a blog. As far as I can tell Mick Ferry was the first broadcast race caller in the world. There weren't even course announcers in 1925. The first race course PA was installed in the USA in 1927. 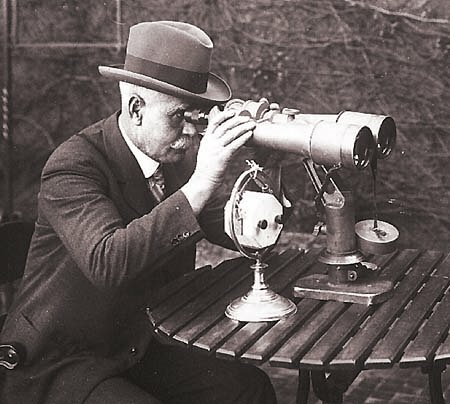 And 4 years before pioneer US caller Clem McCarthy called the Kentucky Derby on radio in 1929, Mick Ferry was broadcasting Fujisan's win in the Doncaster perched on the balcony of his flat with a magnificent set of binoculars - on the wireless. The wireless was one of those many new fangled contraptions of the 1920's and its potential as a public entertainment was still being explored. Mick fancied that describing horses at gallop could be entertaining. He broadcast trackwork from his balcony - and he was right. It was popular, and if they liked listening to trackwork they were going to love listening to the races. To the folks of the 1920's it was just like being there. If you close your eyes, it still is. Is it just the hat, but does Mr Ferry above look a tad like the current Collingwood coach ? The recent changes to the Hall of Fame got me thinking. If the Australian racing industry will not provide an online resource that does justice to the champions of the Australian Turf then I may as well do it myself ! All I want is just a decent picture of each horse, the vital statistics of its race career, a pedigree and a brief telling of the horse's tale would do me. The ARHOF is attached to the Australian Racing Museum and they have all the information at their finger tips, researchers and funding but their web site only marginally improved from appalling to ordinairy in 10 years and finding out the basic information of the horses the HOF is supposed to memorialize is still a bloody internet treasure hunt. ... it's turning into an encyclopedia ! PP7 Has done an excellent job. Not to many of the main protagonists are missing. That thread is exactly what rekindled my interest in The Project. I have taken those records, reformatted them, put in a picture and pedigree chart, tossed in a few links and written a little bio for each neddie. And that is a profile page. ...but you get the drift. The objective of the project is to provide an online resource of information and links pertaining to the history of the Australian turf, with particular emphasis on profiling its champion racehorses. The project is open ended, and as all the pages in it are editable online, more information can be added as it comes to hand, more horses can be profiled, and the project can expand in various different directions. The collection builds over time. I had intended on using this blog as host for the project, but I have changed my mind because the HTML functionality here is a little limited. I have decided instead to host it as blog on Blogger. Blogger has full HTML is free, fast and secure. It will do. Instead of hosting the project on this thread I intend on using this thread for planning - a kind of scratchbox for the blog. It wont be very interesting but it will be useful for my purposes. As it is to be a collection of profiles I need an Index. There are several lists of the Hall of Fame horses, each with different table of information. One details the horses breeding, another their vital statistics, so that the horses can be easily compared. I also have an unfinished collection of profiles of the Horses of the Year since 1969. These profiles are slightly different as instead of detailing their complete race record the focus is on detailing the form of their winning season. A link is provided to their complete career records and pedigree information. Phar Lap's stats include his US start but Shannonn's don't. Shannon won approx $234,000 in the US. Nice proof reading. I will fix that. That sort of correction is invaluable to me. I have only included Shannon's Australian record - and his achievements in the US should be noted. Further down the list (but cropped off the page) I have done a similar thing to Tobin Bronze. I have combined his Australian and US prizemoney - and that's not quite right either. This looks like a job for an asterisk. Another - you haven't credited Amounis with his 3rds. and there should 8 of them. Fixed. Getting back to Shannon, in Australia he had 14 wins and 7 seconds and no thirds, however he had one unplaced run at two, and three at three which makes 4 unplaced. Add that to the 14 wins and 7 seconds gives him 25 starts in Australia, not 24. Do you have a source ? Does it detail his race record ? You say above 25 Aust starts but your "Hall of Fame" shows 24, that was my point just a maths issue I think. I have a listing of his Aust runs but not of his US runs. Yeah, I understand. Maths issue. That's why I repeated the sum, and need to correct the page. But tell me more about Shannons's Australian record. Can you add anything to that ? Many thanks. That should be sufficient to complete at least the Australian leg of his racing record. I am pretty sure I have read online a very full description of his US campaign. I should be able to complete his record from there. My records (from original newspaper accounts) for the latter part of the champion Shannon's career are as follows. It was then announced on Thursday October 9 that Shannon was to be sent to America in a week or two to race there in the colours of W J Smith. His trainer Frank Dalton was not free to go to the US but Barney O'Brien would be given a chance to continue his association with the horse but turned it down to remain with his family in Sydney. No announcement was made as to whether Darby Munro would ride Shannon in the States. Smith said, " Shannon will reach US in plenty of time to acclimatise and be ready for the new season which begins in January and is in full swing a few months later." Smith had been waiting on boat accommodation and this was offered a few days ago. Shannon's record in Australia was 24 starts for 14 wins, 6 seconds and only 4 unplaced races. His total prize-money was £18,987/10/-. He raced more as a 2yo than at any other time. That was the only season he ran in the autumn. From now on the Shannon story became one of travelling to the Sates and of acclimitisation in his new surroundings, with a new training regime and new jockeys with their different styles and tactics. Although he did not prove to be an out-and-our champion under these new condidtions, Shannon accquited himsel well. There were a problem over the registration of Shannon in the American Stud Book. The problem arose form three English mares who came to Hobart in 1826, the mares were Spaewife, Cutty Sark and Fortune Teller. Fortune Teller died on the journey out from England, After the arrival of the living mares and the dead mare there was confusion for a number of years as to who was whom. A foaling of Spaewife was attributed to the dead Fortune Teller. Shannon descended from Spaewife and this foal. The confusion was eventually cleaned up for the Australian and New Zealand Stud books but had not in 1947 been accepted by the English or US Stud books.. So of his 4096 ancestors, back 12 generations, there was doubt about two of them in that 12th generation! This problem was eventually overcome at the NYJC meeting of February 12. In mid-Januray a Neil McCarthy, a lawyer from Los Angeles purchased Shannon intending to race him for an indefinite period and then retire him to the stud. Shannon commenced racing in California in mid February but at first failed to live up to expectations. Given more time to settle in to his surroundings, he resumed in May at the Bay Medows meeting and won there over 9.5f. Later that month Shannon won over 8.5f at Hollywood Park. After a couple of subsequent failures, Sahnnon took out the prestigious 10f Hollywood Gold Cup on July 17. In this race Shannon carved out the distance in 2 1.3 (at that time the Australian record for the distance was 2.1.75). The prize-money won by Shannon was £21,125. This took his American winnings to £34,525, with 3 victories. His lifetime winnings were now £53,512/10/-. Shannon carried 8.4 in a field of 9. He won by 2 lengths from On Trust, with Othaverry, 1.5 lengths away third. Shannon was ridden by John Adams. The horse broke fourth, galloped easily without the whip for the first six furlongs, moved up on On Trust at the home stretch, took the lead a furlong from the post and, under the whip, came away for a clear win. McCarthy was not present to see his horse win; he was on his way to the Olympics in London. George Moore watched the race. He commented "Shannon looked in much better condition today than when I was here before. It was a marvellous performance by the jockey and the horse." Trainer Willie Molter said "I think the track today would have suited Shannon." The press comment was unanimous in its praise of Shannon. A wek later Shannon ran third over 13f. Shannon had then won £33,500 at the Hollywood Park meeting and was the leading prize-winner. 1948-49. Now racing in the United States, Shannon had three starts this season before being retired to the stud. Again the champion displayed his quality. In late September at the Golden Gate meeting he carved out a brilliant victory over 9f in world record time of 1.47.6. Shannon got away slowly and was not called until the back straight. His stable-mate On Trust led early in the race. Shannon spurted ahead in the straight. On Monday October 23 the SMH reported an even greater win by Shannon in the US. He had equalled the world record time in winning the £23,437 Golden Gate H'cp of 10 furlongs. He ran the time in 1 59.8, breaking the US record of 2 minutes flat. It was quite a few years before that mark was broken in Australia. Jack Westrope again rode Shannon. He won by 2 lengths from See-Tee-See with Stepfather 3rd. His stablemate On Trust finished 4th, Shannon’s winnings of £19,062 took his American earnings to £60,409 and his total earnings to £77,396. Thus win made Shannon Australia's then greatest stake-winner, surpassing Phar Lap’s £66,738. Newspaper headlines about Shannon were "powerful Australian cannonball" and "7yo bullet from Down Under". Owner McCarthy said 'I only need say that his victory a week back and this latest miraculous win is a complete justification of Shannon. I hope all his critics are at last satisfied." Shannon broke well, was in the clear on the outside all the way. He was fifth or sixth going down the back, moved up to be third at the 3/4 mile mark and there was "just breezing". His jockey said "He could have gone to the front at any time. When I did ask him really to move he responded immediately and we came around the leaders on the outside. When he was straightened up for home and in the clear, I took him on to the rails and he just galloped on in." Shannon now had 5 wins in 17 US starts. There was one more start for the Australian champion. In early November he finished third, a neck behind the winner Please Me, at Taniform, San Francisco in the Marchbank H'cp. The race was won by Please Me form Tropical Sun. Shannon finished a neck behind the winner. He led after the turn but was run down. There was talk of a showdown between Shannon and the young American three-year-old champion Citation in the Taniform Handicap but Shannon was handicapped to give 4lb to Citation and his connection thought this was not to Shannon’s advantage. McCarthy believed the horse had been given too much weight. Shannon was now retired and sent to a stud in Kentucky. The champion was sold to a syndicate: 30 shares, each worth £3,125. McCarthy certainly had made a killing on Shannon. A nation-wide US poll rated Shannon the outstanding horse of the year in the four-year-old and over class. Much appreciated Brian I will be able to use all of that. I think I remember where I read the account of Shannon's US career. It was very likely yours. We seem to have a point of contention over how many Australian starts he had. I'll leave it as an open question until I have done some more research of my own. The reluctance to accept Shannon into the American studbook is ironic given the prevalence of the so called 'Jersey Law' by the Jockey Club in the UK. Lord Jersey was a steward of the Jockey Club who recommended a prohibition of any further entries to the General Stud Book unless the horse's pedigree originated entirely within the GSB, Therefore, all the descendants of the great American sire Lexington for example were excluded from the GSB from 1913 onwards as back five generations in Lexington's pedigree the inaugural English Derby winner Diomed was put over an unidentified American mare. The fact that Lexington appears in the pedigree of most American thoroughbreds was of no consequence - they were excluded from the GSB as 'half bred'. The same 'law' also excluded any Australian horse whose entire pedigree was not contained within the GSB. As I said earlier it is my intention to use this thread as the sandbox for my project to profile the champions of the Australian Racing Hall of Fame. To that end I think I need a log of my progress. 11 June 2011 : I uploaded a detailed list of the 37 inductees on the HALL OF FAME page and a test profile of THE BARB on its own page. I linked the name of The Barb on the Hall of Fame list to his profile page and included an Index link so that I could click and return to the Hall of Fame list that also serves as the Index. 16 June 2011 : Empty pages for all 37 inductees are created and linked to the Index. The structure of the site is now complete but it is essentially a bunch of named but empty pages. Mainly this week I have been testing about the capabilities of the Blogger and have been very satisfied that it is the quickest, easiest and least expensive means of hosting the site. Now the structure is in place and fully functional I can begin to upload information and graphics to those named pages. 18 June 2011 : Profile picture uploads continue. I decide to complete one profile - The Barb - before proceeding with further uploads of material for the other profiles. Not entirely happy with the default Index the Blogger provides. Considering a stand alone web page as the 'hub' of the site, with links to the Blogger profiles from the hub. 19 June 2011 : The Barb profile is more or less complete (requires proofing & linking especially in the credits area. URL first released for folks who like looking at construction sites Ver 0.01. Essentially it is an Index and one profile at present. The links from the Index lead to the empty profile pages of the remaining 36 champions - a electronic filing cabinet. In some pages there are pictures filed away. I couldn't track down his full record anywhere, so only his wins are shown - the 2nds are courtesy of the AJC records..
Had the same problem with Better Loosen Up.